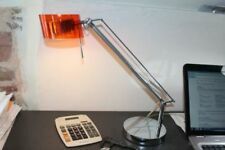 The adjustable reading lamp and can be easily positioned for maximum comfort with its manoeuvrable 360 degree "goose-neck" design and stands 163cm (64in) high when fully extended. You will be given a free pre paid label to send your faulty or unwanted product back at no cost to you. Matching pair of wall lights; ceiling light and curtain tie backs available. New listingNext Brushed Copper Floor Lamp - 3 Lamp Leaf Design. Next Brushed Copper Floor Lamp - 3 Lamp Leaf Design. Condition is Used but in great condition. In full working condition and can be dim with the switch on the lead. Collection only. Please ask any questions and happy bidding. Have a look at my other items. Thanks for looking. Opened for testing and little damaged box Can has some marks Choice of Black or Grey Height 143cm.Diameter of base 24cm.Diameter of shade 17cm.Foot switch.Suitable for use with low energy bulbs, .Bulbs required 1 x 46W ES 30W halogen eco golfball or 1 x 60W (not included). 1 uplighter and 1 lower adjustable light. Cash on collection. The Chelsea Chrome Floor Lamp With Cut Glass Shade is a contemporary take on the traditional, vintage bar lamps. Bulb requirements: E14 golf ball, max. 40W. Dimensions: H 142 x W 63 x D 25cm. QUALITY BRAND**CHEAPEST PRICE ONLINE**FAST DESPATCH This decorative mother and child floor lamp features two different points of light which makes ideal for not only a great source of additional lighting, but also a great reading lamp which makes it a ideal addition to any living room or hallway as well as for a great bedside reading lamp Product Type: Floor Lamps Number of Bulbs: 2 (Included) Colours: Antique Brass Height: 184cm Diameter (cm): 29cm Material: Chrome Product Weight: 6.21kg Light Source: Halogen Dimmable: Yes Technical Information Requires: 1 x 230 Watt R7 1 x 28 Watt G9 Halogen - Bulbs Included Please note: Images are for illustration purposes only. Due to the nature of this product, when purchasing multiples of this item please note there may be slight. Paper Lantern Shades. Bathroom Lighting. Ceiling Pendants. This minimal yet charming floor lamp features 2 directional lights that provide strong highlighting beams, perfect for adding brightness to your living room or study area. Opened for testing and MISSING white shade which should be inside of the lamp no problem with use. I showed on last photo Little damaged bx With a curvaceous bottle-shaped framework, this truly modern floor lamp will create a mellow and relaxed atmosphere in any room. Height 110cm.Diameter of base 28cm.Diameter of shade 28cm.Weight 2.3kg.Suitable for use with low energy bulbs, max 9 watts (ES GLS eco halogen bulb).No wiring required.In-line switch.Bulbs required 2 x 28W candle ES edison eco halogen (not included). Ornate detailing on fretwork. Colour: Silver. Cable Length: 1.8m. Weight: 44kg. Floor Standing Lamp, Black coloured Metal, Extendable Reading. Change of lounge décor prompts to sale. QUALITY BRAND**CHEAPEST PRICE ONLINE**FAST DESPATCH This decorative mother and child floor lamp features two different points of light which makes ideal for not only a great source of additional lighting, but also a great reading lamp which makes it a ideal addition to any living room or hallway as well as for a great bedside reading lamp Product Type: Floor Lamps Number of Bulbs: 2 (Included) Colours: Chrome Height: 184cm Diameter (cm): 29cm Material: Chrome Product Weight: 6.21kg Light Source: Halogen Dimmable: Yes Technical Information Requires: 1 x 230 Watt R7 1 x 28 Watt G9 Halogen - Bulbs Included Please note: Images are for illustration purposes only. Due to the nature of this product, when purchasing multiples of this item please note there may be . Incandescent Equivalent 40 watts. The Flexible reading light at the mid point makes it very useful for reading and need point. 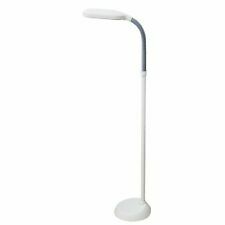 -Fixed floor standing light with flexible mid placed reading light. Area Lighting Classification IP20. 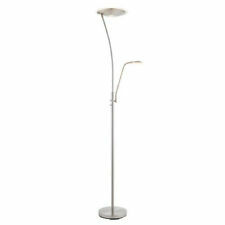 Tall Floor Standing Lamp Reading Light Uplighter. Dimmable. Tall Floor Standing Lamp Reading Light Uplighter. Excellent condition. Dimmable. Takes halogen or Energy saving equivalent bulbs. Unique Modern Twisting Driftwood Floor Lamp with uplighting halogen bulb. A Truly Stunning & Unique Driftwood Design with Elegant uplighting from a halogen bulb. Materials: driftwood stem. This lamp has 1 x halogen bulb (supplied). Opened for testing Can has some small marks Suitable for use with low energy bulbs. Foot switch. Assembly required. No wiring required. Opened for testing Damaged box This modern silver floor lamp looks great in the home. 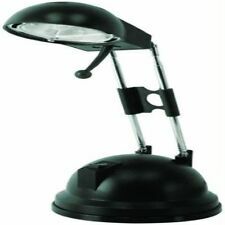 The father and daughter design has adjustable spotlight heads, making it ideal for reading or close work. Height 181cm. Diameter 44cm. Diameter of base 23cm. Diameter of shade 25cm. Adjustable heads. In-line switch. No wiring required. Weight 4.6kg. Dimmable floor tree light. Takes both halogen or LED plugs. Used for low lighting, overhead reading light or decoration. Has a curve so you can place it perfectly in a corner to shine over a chair or sofa. Unique Modern Driftwood Floor Lamp with uplighting halogen bulb. A Truly Stunning & Unique Driftwood Design with Elegant uplighting from a halogen bulb. Materials: driftwood stem. This lamp has 1 x halogen bulb (supplied). Opened for testing Has some scratches Damaged box This modern silver floor lamp looks great in the home. The father and daughter design has adjustable spotlight heads, making it ideal for reading or close work. Height 181cm. Diameter 44cm. Diameter of base 23cm. Diameter of shade 25cm. Adjustable heads. In-line switch. No wiring required. Weight 4.6kg. Next Brushed Copper Floor Lamp - 3 Lamp Leaf Design. Hertfordshire Area. Opened for testing Little damaged box With a curvaceous bottle-shaped framework, this truly modern floor lamp will create a mellow and relaxed atmosphere in any room. Height 110cm.Diameter of base 28cm.Diameter of shade 28cm.Weight 2.3kg.Suitable for use with low energy bulbs, max 9 watts (ES GLS eco halogen bulb).No wiring required.In-line switch.Bulbs required 2 x 28W candle ES edison eco halogen (not included).